San Jose, CA, September 12, 2017: AKON, Inc. announces a new line of Dual-Channel Low Noise Amplifiers, covering the overall band of 1.5 to 6.0 GHz. The line consists of three individual products; the A25-LL352 covering 1.5 to 3.5 GHz, the A25-LL351 covering 3.5 to 5.5 GHz, and the A25-LL353 covering 4.0 to 6.0 GHz. All are true Dual Channel Amplifiers, featuring two separate and independent amplifier channels in a common compact ruggedized package. All three amplifiers feature small signal gain of 40 to 43 dB nominal, a noise figure of 1.5 dB or better typically (at 25 °C), and an output 1 dB gain compression point of +10 dBm. 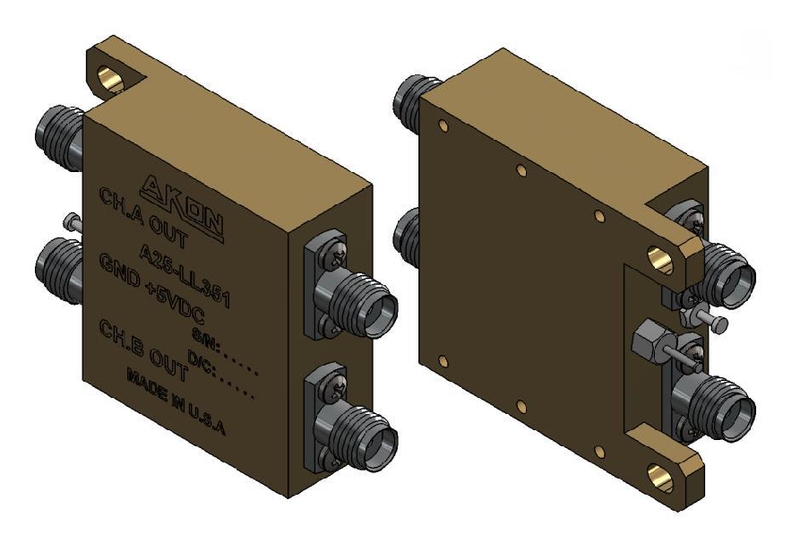 These units are ideal for dual-feed, dual polarity antenna systems. AKON is now accepting orders for and shipping this product.